Opened on 2 April 2015, The Rosti Farm opens its doors at the Capitol Piazza! Part of the Once Upon a milkshake team, you can enjoy a rosti and have a wonderful milkshake at the same time! The simple, Rosti Farm menu, focused on Rosti, of course. 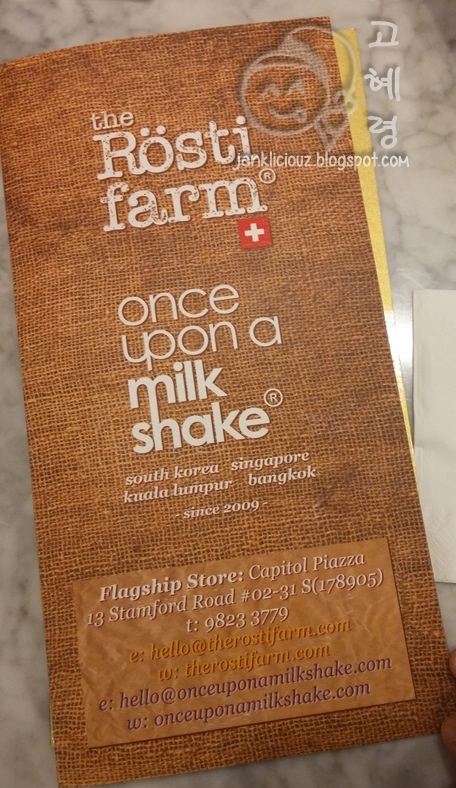 Once upon a Milkshake + The Rosti Farm... + Teuscher Chocolates! All under the same 'roof'. Crispy! It was a delight having it with the nacho cheese, though it didn't wow. It looks as good as it tastes and I love the light sour cream placed on the side. Lovely! But I thought the outer layer for the rosti could have been slightly crispier. The Hardworking Farmer (Single Rosti: $18, Double Rosti: $21) - Swiss cheese, oven-roasted chicken breast (sliced) with creamy sauce, snail sausage (pork), sauteed mushroom, mini omelette.